Frank Williams can recall to this day, with almost absolute clarity, the verses of the books of the Bible, from Genesis to Revelations. And if you happen to accidentally trip over, or even skip a word or two when reciting them to him, he’ll know, and he’ll correct you. Williams is a great conversationalist, and in his talks, with even strangers, he doesn’t hesitate to offer them words of encouragement. One thing betrays these rather unmistakable attributes of someone full of youth and an abundance of energy – Frank Williams, on the 9th of September this year, celebrated his 103rd birthday. Born in the year 1914, Williams has seen and endured much of the nation’s struggles for identity and freedom, and even in those tumultuous times, he managed to carve out a life for himself, despite not having much to work with. 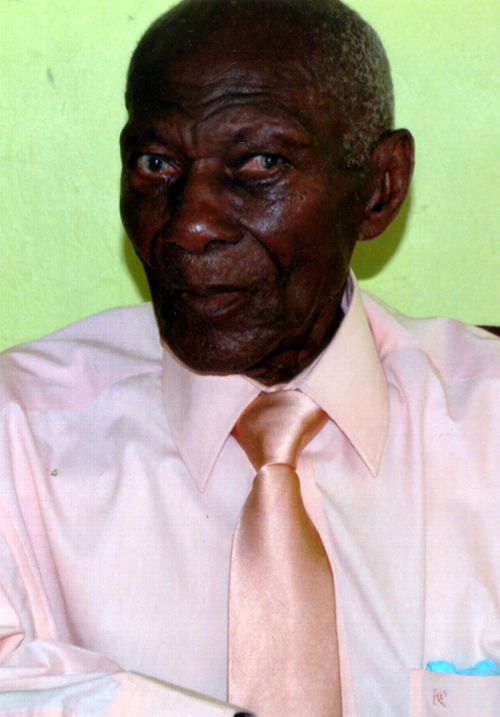 In Beeston Spring, Westmoreland, the place where Williams lived and grew up to parents Benjamin Williams and Edith Tomlinson, he found that he only needed one thing to make him an honest man – working to put food on the table for his family. Clinging to that principle would drive him for the rest of his life, even to the days when he found himself in the position of parent, fathering seven children of his own. To simply put food on the table for his family, Williams ventured into a number of different career paths. At one point, he found himself cutting cane, then at another, he was digging trenches. And when those things no longer served his one driving purpose, Williams tried his hand at shoemaking, until he finally opened up his own shop right there in his community. There, he would hone a skill he would find himself using even in his early hundreds – playing Domino. Williams went around playing in tournaments, and made companions from that leisure activity, as they would sometimes gather at his shop and play for hours on end. …when they would joke at him that most of his money was spent on food, he would respond that he needs no bank account, because they – his family – were his savings. Now decades beyond those earlier years, little has changed about Williams. He is a man who loves, and embraces his role as a jovial being, full of life and fervor. Speaking to some of his relatives, the Western Mirror learnt that Williams clung to his mantra of always providing food for his family so much, that some jokingly poked that Williams spent all his life’s savings on food. And though he wasn’t a man big on formal education, he always instilled in his children to be honest people, and to treat those around them kindly. These strong values no doubt helped in the culture of excellence that now flows from generation to generation within his family, with some of his children becoming doctors, grandchildren who are lawyers, and other relatives who have gone on to do well for themselves. So proud is he of these achievements, that when they would joke at him that most of his money was spent on food, he would respond that he needs no bank account, because they – his family – were his savings. The highly religious Williams, who got baptized in 1942, also got married in that same year, and though his wife predeceased him, Williams continues to hold to the young, bliss-filled memories of those earlier and youthful days. Now wheelchair-bound but still full of life, the centenarian refuses to grow old. “Williams, how old are you?” – To anyone who would ask that question of him, the 103-year-old always had an answer: “I’m 3 years old.” That’s as old as he’ll ever get in his mind. Even so, life continues to be a bliss for the young-at-heart Williams, so long as he is surrounded by those whose voices he can never forget – his family.